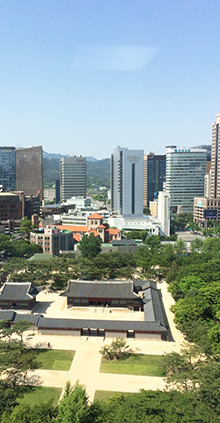 Deoksugung or Deoksu Palace is contrasted by the high-rises in downtown Seoul, showing the traditional culture is well blended into its ultra-modern culture. It is one of the five major palaces in Seoul all build during Joseon Dynasty (1392-1910) when Confucianism was its state religion. With 25 million in and around the capital Seoul is one of the largest cities in the world in terms of population. Koreans express national pride in earnest and most often endearing — and even lasting. It can take in the form of small talk in coffee shops down to a more serious one during meetings. Notably, bartenders to the bus drivers serve as their cultural ambassadors, ready to teach you what it means to be Korean like sharing basic awareness of Korean culture that can go a long way in making one feel at home. In this Land of the Morning Calm, Confucius is king. He reigns over every part of Korean society, imposing virtues, structure and sense. In fact, traditional Confucianism is said to fuel the city’s hums and happenings — all in between families, friends, lovers, colleagues, neighbors and strangers. With over 25 million—half of South Korea’s total—Seoul rivals Shanghai, Mexico City, and New York in terms of population. Seoul’s subway system is the world’s most crowded. The city’s public spaces are packed with pedestrians, vendors, marketers, and food stands. Accordingly, there’s urban chaos that defines Seoul save with the mix of an old, traditional social system. However, this city is generally peaceful and culturally-driven. And take these strolls in a day or two: wander into a Buddhist temple once the ceremony is over, or simply stumble down a winding back alley on Seoul’s Bukchon Hanok, a traditional village that reflects 600 years of Seoul’s history. Once in Korea, speak in Konglish. It is a mashup of English words that Koreans have adopted into their own language. If you don’t know Korean, Konglish comes in handy. The demilitarized zone is not really demilitarized. Life along the 38th parallel is a stalemate—the two sides are technically still at war—with tension captured in a still-life. Go to Panmunjeom for a glimpse of the surreal. North and South Korean soldiers standing face-to-face at the Joint Security Area, or a fake North Korean village, lit up and brightly painted, but empty. Seoul is the world’s most connected city. Wi-Fi is integrated into every subway station, platform, train, and many public spaces, including some energy-efficient street lamps; transit stations are equipped with digital information terminals; and virtual stores, posted on street billboards, enable shopping and scheduling deliveries on the go. Low-income families are given free second-hand smart devices. The u-Seoul safety service pairs CCTV technology with GPS devices to alert caregivers and authorities when children, the elderly, and people with disabilities or Alzheimer’s stray from their designated safe zone. Driven by expansive infrastructure and competitive business environment, the city boasts super high-speed Internet at super low prices. Seoul’s city buses are the most common means of transportation. Buses here are frequent, reliable and probably the most inexpensive way of getting around, though taking the bus can be confusing for someone who does not know Korean. Seoul's bus network is extensive. There are approximately 400 bus routes with 8,500 city buses, connecting the farthest corners of the city. An exclusive lane for buses marked with a blue line painted on the road is enforced on city roads at daytime, which makes it possible to spend less time on bus rides than in private cars. And basically, Koreans are romantics at heart. They have their distinctive ways to display their love — like couples dressed in matching outfits, or simply hugging and kissing at the city’s sky park. Take Seoul by heart, and go K-pop all the way. This is Seoul.